It’s Christmas Eve! Everybody must be busy preparing on what to serve on the dining table! I guess everyone is thinking of what cake to bake because Christmas won’t be complete without a good cake or dessert. Since you are already busy preparing gifts and cooking variety of dishes (and not to mention they are already time-consuming), let me give you a really easy and delicious but takes a small amount of time to prepare & bake —- brownies! I guess everyone knows what a brownie is but for those who doesn’t it is a type of flat rich cake usually cut in small squares. It originated in United States during the 19th century during a Columbian Expo held in Chicago where a chef at Palmer House Hotel created a dessert after Bertha Palmer (wife of hotel owner) requested a type of cake that is small which can be easily packed and eaten from boxed lunches. That first brownie was glazed with apricot and infused with walnuts. Since then the recipe became really popular and spread all over the world. Many variations have been made usually dependent on the local ingredients available to a location, so nuts have varied from one place to another. Now there are even ready-made mixes available at your supermarket but that replaces the excitement of creating your own. So if you want to have pride in making your own recipe here is a basic one that I can share. Enjoy! Pour the mixture into a non-grease baking pan. Bake for 28-35 mins in a preheated 180 C.
What a lovely easy brownie recipe. Looks simple and rich tasting. I vowed to stop baking after my birthday angel food cake fiasco, but brownies can’t be that hard to make, right? Can’t resist walnuts and chocolate! With all the crazy desserts on the blogosphere lately, these simple and delicious brownies sound perfect and extremely appealing! This recipe looks so yummy I think I’m going to have to make it. I’ll have to tweak it a bit to be a little less sugary, but I do believe this will be awesome. thank you so much for sharing, and Happy Holidays to you. Thank you for sharing the good looking recipe I look forward to trying it and I will have to cook one as is and then tweak one for me. I always wanted to know the historical background of a food, so I research over the net or even ask my friends who knows information about a food’s history. My interest on determining the history of a food started when a chinese friend of mine told the story about how mooncake was invented, I was so amazed a simple mooncake have a very rich history. Since then I was intrigued the richness of history of a certain food item. Yes you can but it will have a different texture. 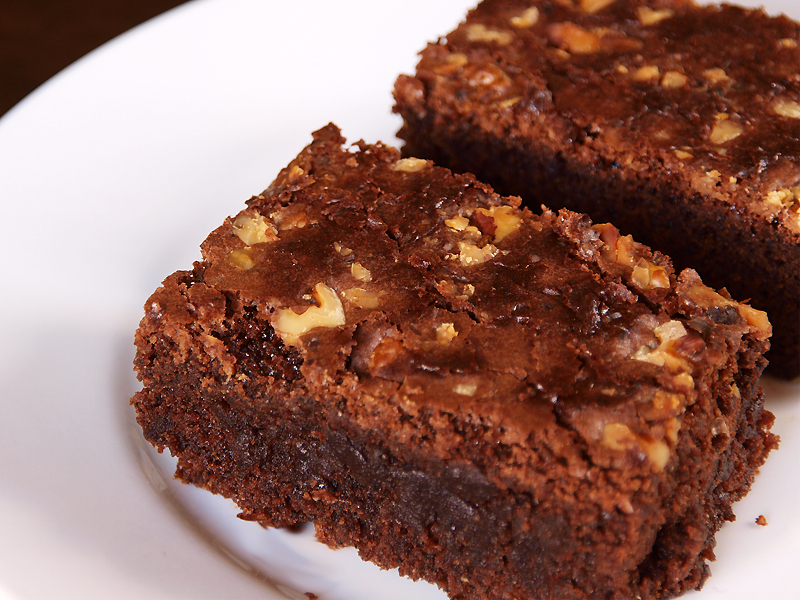 Sugar usually makes the brownies light and tender and removing them will make your brownies thinner and drier. Now to compensate for the texture remove 2 egg whites from the recipe for the 1 cup of sugar you removed. Now the flavour will not be the same so compensate it with other things like dried fruits, so I suggest for every 1 cup of sugar you removed add 1/2 cup of unsweetened dried fruit. Hope this helps.